In the new story over at Rare that Steve Quayle linked to on his website on Monday they report that scientists are worried a mysterious “zombie” disease which is now killing deer could spread to humans, with deer all across North America dying from the mysterious disease that gradually destroys the animals’ nervous systems. 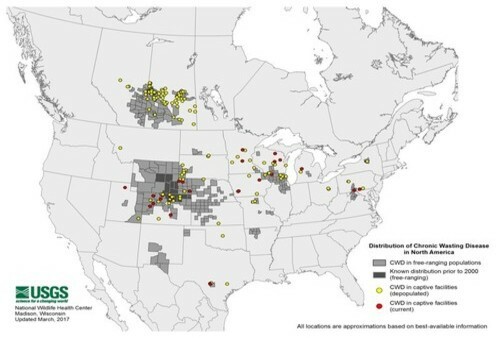 While one could easily be forgiven for thinking 'zombie deer' sounds like 'fake news', the Atlanta Journal Constitution reported on January 19th that the 'brain-wasting zombie deer disease' has indeed infected wild herds of deer in at least 24 states and Canada, as well as in Norway and South Korea, and distributed as seen in the map of known cases below. And while as of yet, there have been no known human cases of the disease, a recent study suggests the prions that causes the disease within the brains of deer are still evolving “which leads us to believe it's only a matter of time before a prion emerges that can spread to humans” claim scientists who have been studying this. As West Virginia's National Public Radio reports, the chief concern is for those who eat venison with their story asking the question: Would you eat venison if there was a chance it could slowly eat away at your brain? Described by the scientists studying it as similar to 'mad cow disease', another concern they have about the little understood disease is the belief that it can also be spread by sick animals and cadavers spreading it upon plants and soil, which they warn could be coated with deformed proteins (which prions are made of) for years, perhaps even decades. 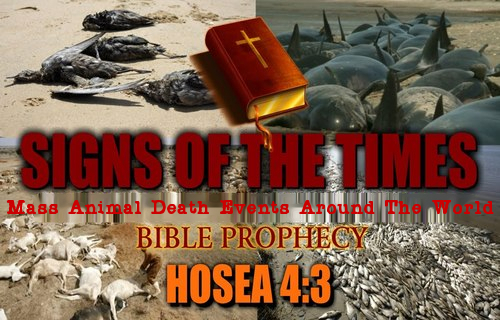 Warning also that infected animals can live up to two years with the disease before showing symptoms which include a vacant stare, thick saliva, exposed ribs or drooping heads, this mass outbreak is just the latest in a series of 'mass animal death events' across the planet that the website End Times Prophecy Blog has been keeping track of for 6 years running. In the eye-opening recent story over at the website Strange Sounds they reported that 200,000 Saiga antelope were recently wiped out in Kazakhstan by what is being called a 'mutant bacteria', a bacteria that is normally harmless in the animals' bodies. Warning that 'total extinction' for these animals was on the horizon with nearly 2/3 of the population decimated, why would a normally harmless bacteria suddenly morph into an extinction-level killer? While human beings are busy fighting our own battle against a flu that is now being called responsible for killing up to 100 people a week according to this recent story from The Big Wobble, the note Steve Quayle left while linking to that story warned "the bio-morphs have been released globally - think Deagel Report on global scale". Another extremely interesting SQnote that Quayle left while linking to this Rare story about 'zombie deer' warned that years ago, 2 prominent scientists who were studying 'brain-wasting disease' in Wyoming elk were suddenly killed in what authorities had reported back in 2004 was a car crash. Just 2 of many on a seemingly unending list of prominent scientists, microbiologists and holistic health practitioners who have come to their mysterious and untimely ends, is something sinister going on with experts on issues such as biological and chemical weapons being killed off in mysterious fashions, and dating back to at least 1994? Coincidentally, or not, Bill Clinton became president in 1993. One interesting side note, several years ago a friend shared with me a story about what happened when a neighbor of their's suddenly died from Variant Creutzfeldt–Jakob disease, the name for mad cow disease in humans. 'Officially', only 4 people in the US have ever had the disease according to the CDC and his death is not listed. As my friend shared with me, for weeks after it was determined that this person had the disease, the house they lived in was completely sealed off with official vehicles lining the street for days, everybody going in and out of the house wearing biohazard suits. The kind, older gentleman who had passed away spent his career working as a scientist for the FBI. In an explosive post on Sunday, QAnon explained the Barack Obama/Hillary Clinton 16-year treasonous plan to use two White House terms for a coup d’état in the United States that would end up revising the Constitution, cancelling the Second Amendment, and opening borders to flood the nation with illegal immigrants calculated to vote Democrat for the foreseeable future. An American nightmare under President Hillary Clinton QAnon predicted that Hillary would use her 8 years as president to cause World War III – a war that would cause death and destruction on a massive, never-before-imagined scale of horror. The war would be a “fake war” promoted by the government-controlled MSM. Billions of the world’s populations would be killed off, allowing the globalists (including Hillary, Obama, Podesta, and their co-conspirator minions) to pocket huge wealth on a global scale. When the Obama/Hillary 16 years in the presidency were completed, the U.S. middle class would be destroyed. 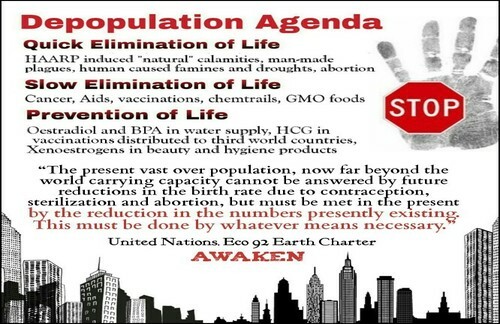 The U.S. population (what was left of it) would be reduced to a status of enslavement, starvation, death, and disease. When the Obama/Hillary 16 years in the presidency were completed, the U.S. would have no borders, the Constitution would be revised to remove the Bill of Rights and all fundamental U.S. freedoms, and the population would be disarmed by the repeal of the Second Amendment. When the Obama/Hillary 16 years in the presidency were completed, there would be no electoral college. So...if they had all that planned for us under a Hillary Clinton presidency, and judging by the ever-expanding body count, the flooding of the US with illegal immigrants, the lies of the msm and Hillary's lust for death and war, there's little to prove that Corsi's wrong, what lows might they stoop to to kill us all off? And while we haven't written much about Q on ANP as he's an anonymous source, we've got to ask the question considering everything else we've been watching unfolding across America over the past decade. 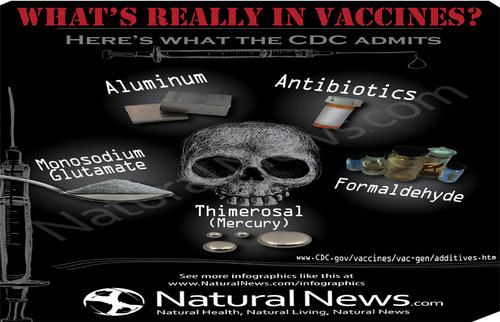 And with all of the dead scientists and microbiologists over the years, might there have been a conspiracy to silence those who unwillingly have been helping the globalists complete their depopulation agenda? With formerly benign bacteria suddenly transformed into what has played out for some animals to be an extinction level event while the flu suddenly turns into flesh eating bacteria, we wouldn't put anything past those who were long-working to destroy America. As Steve Quayle recently told ANP, "the killing fields have turned into the culling fields of the globalist grim reapers."